Scared to Death is primarily remembered as the answer to a trivia question. What is the only color film with Bela Lugosi in a starring role? And sadly, that’s all it deserves to be remembered for. It’s a good example of a waste of a perfectly good cast. The film begins with medical examiners revealing that a beautiful woman, Laura Van Ee (Molly Lamont) has literally died of fright. The story is then told in flashback of how she died. 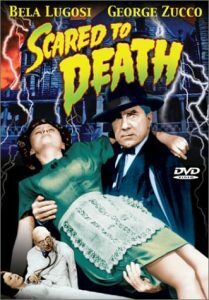 Laura is unhappily married to Ward Van Ee (Roland Varno), the son Dr. Joseph Van Ee (George Zucco, The Mad Ghoul), the proprietor of a private sanatorium, where she is being treated. But, she doesn’t feel that there’s anything wrong with her. Arriving on the scene is a mysterious visitor, Professor Leonide (Bela Lugosi, Dracula, Son of Frankenstein) and his deaf/mute/dwarf companion, Indigo (Angelo Rossitto). Leonide is (apparently) the doctor’s estranged cousin, a former hypnotist in Europe. Other members of the household include Bill Raymond (Nat Pendleton, At the Circus, Buck Privates Come Home) as a comically inept security guard — and former homicide detective. He’s in love with the maid Lilybeth (Gladys Blake) — who doesn’t return his affection. Laura is clearly frightened of the Europeans, and after various shenanigans (Lilybeth being hypnotized, being thought dead, Dr. Van Ee being assaulted, a mysterious green mask being seen by various people through a window, etc. It’s finally revealed that Laura is the former wife and stage partner of a Paris magician known as Renéé. He is believed to have been shot by the Nazis. Attempts to draw a confession that she had betrayed her magician husband and had collaborated with the Nazis led to the use of a death mask of the supposedly dead patriot, which literally frightens her to death. As I say, Scared to Death is a good example of a wasted cast. Both Bela Lugosi and George Zucco are veterans of the horror movie genre, Nat Pendleton and Joyce Compton are very good at playing comically dumb characters, etc. — and the movie drags.